Luton Town defender Dan Potts has given the club a huge boost by signing a new three year deal. 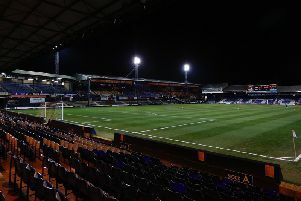 The 24-year-old, who joined the Hatters back in May 2015, has been the subject of some intense transfer speculation over the summer. Boss Nathan Jones confirmed a bid from a Championship club had been turned down, with Potts now committing himself to Kenilworth Road for the foreseeable future. Speaking earlier today, Jones said: “It’s great news for the club, for us as staff, and the squad that he’s committed his future for three years, we’re delighted. A brilliant season last term saw Potts made 45 appearances, scoring seven goals and earn a place in both the EFL and Sky Bet League Two team. Boss Jones wasn’t surprised to see that kind of form attract potential suitors from the second tier of English football, but believes Potts can get even better while at Luton. He added: “He had one year left on his contract, we were tested by a Championship club, but we have certain processes here. “We think we do good work, we think we’ve improved Dan significantly, we don’t think we’re anywhere near the ceiling on Dan Potts. “He believes that as well, he enjoys it here, and we believe we can continue that journey. “I’m delighted once again the club has backed me and turned that down as there’s not many at our level that can turns down the type of bids we are turning down and keep their best players.